The techniques used for identity verification vary from the conventional use of passwords to highly sophisticated techniques like iris scanning, face recognition and fingerprint imaging. Secure passwords often have the trade-off that the higher levels of security require more complicated passwords, which are as a result more likely to be written down or physically stored, thereby compromising security. Fingerprint is widely recognised as the best identity verification method and has been used for many years in different forms. While iris scanning, face recognition and DNA are widely accepted as accurate and more difficult to fake, they are costly and slower than other methods, at least for now. 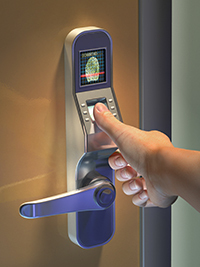 Fingerprint sensors are currently used in professional markets like border security, access control and civil applications, and more recently in consumer electronics and banking. The technology for fingerprint sensors is broadly segmented into capacitive and optical sensing. Capacitive fingerprint sensors detect the changes in capacitance as a result of the ridges and valleys on the fingers causing a variation in the separation of the skin from the detector surface. However, they suffer the drawback of not being accurate enough for high security applications and also do not work in the presence of wet hands or humidity. Optical fingerprint sensors are predominantly used in the professional market, but they are very bulky due to the complex optics used. This contributes to their high cost, in addition to the complementary metal-oxide semiconductor (CMOS) sensor cost. Moreover, these scanners are negatively perceived by the end-user as they are associated with border security or police applications. In order to seamlessly integrate the use of fingerprint scanners in banking and other new markets like point of sale (PoS), the fingerprint sensors need to become part of the user-interface. 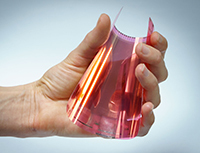 Today, this can be achieved with flexible electronics. FlexEnable’s organic thin film transistor (OTFT) technology on plastic paired with an organic photodiode (OPD) technology enables label-thin, lightweight and robust large area fingerprint sensors. In addition to being cost competitive, they can be easily integrated into products because of their flexibility, revolutionising where and how fingerprint scanning can be implemented. A lot of work has been done on identifying fake or dead fingerprints. With FlexEnable’s large area sensors (developed with partner ISORG), both the fingerprint and the vein can be captured thereby resulting in verifying identity using more fingerprint information captured from the hands and pairing it with vein imaging. Today, fingerprint sensor companies and product companies and brands are looking for ways to integrate optical fingerprint sensors into products which are more appealing to the end-user, and the ability to conform sensors to existing objects opens up many exciting design and application possibilities. If you want to learn more about our fingerprint and vein sensor solutions for biometric applications, contact us at info@flexenable.com. We will be exhibiting at IDTechEx Show in Berlin on 27th and 28th April 2016. Visit us on stand C12 to see a demo of a large area fingerprint sensor on plastic.